“We’re working with the children,” said Nancy Axelrod, Center for Environmental Transformation board member. 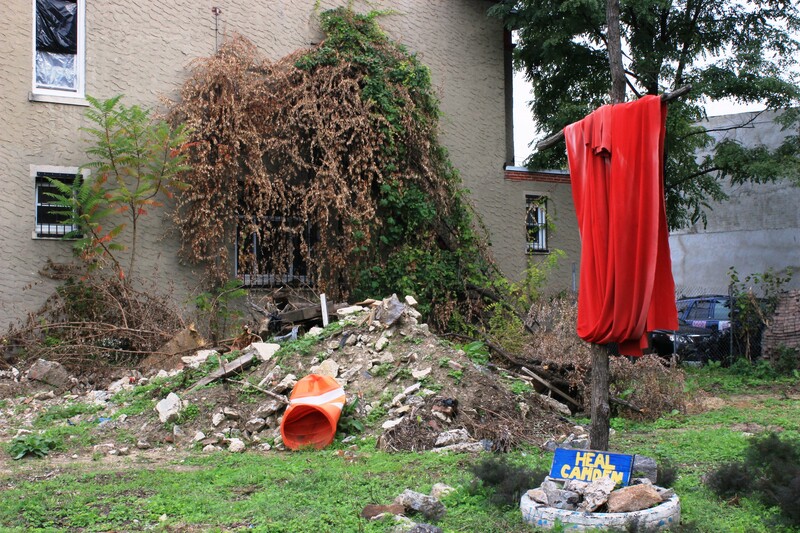 When you walk the blocks surrounding Sacred Heart Church and school and Center for Environmental Transformation in Camden’s Waterfront South neighborhood, you wonder whether an impact is felt despite all the best efforts of Father Michael Doyle, church members and volunteers. Our toilets flush and the waste goes ‘away’ – to Camden. Waterfront South is home to several thousand residents and the Camden County Municipal Utilities Authority, the trash-to-steam plant, and other industries that spew particulates and bring trucks and tractor trailers chugging through the neighborhood. Nancy Axelrod and center president Mark Doorley led nine of us on a walking tour of a part of Waterfront South where the church, center and the non-profit housing company Heart of Camden have led programs to bring not just development and improvements, but hope in the lives of the men, women and children who have called Waterfront South home for generations. You see the gardens where fresh fruits and vegetables grow through the summer and in the greenhouse across from Sacred Heart and the outdoor brick oven where children learn cooking skills. 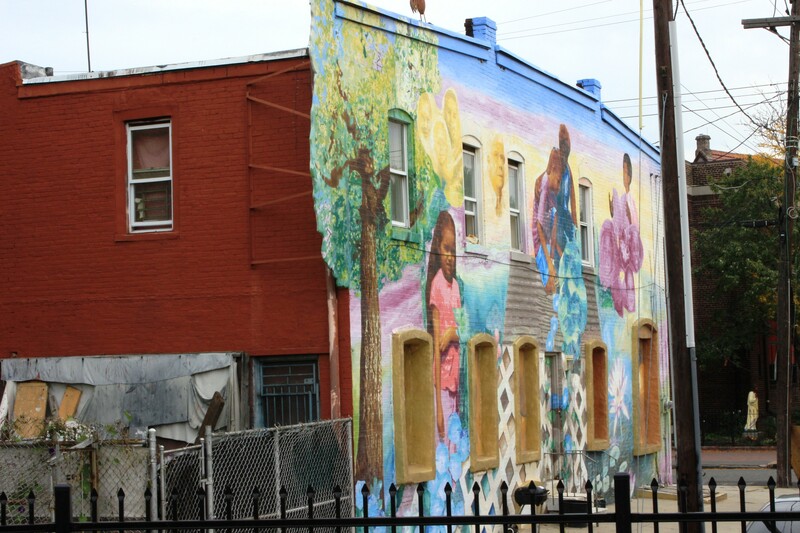 Colorful murals, brightly decorated facades on row homes and newly planted trees in a park are signs of progress. 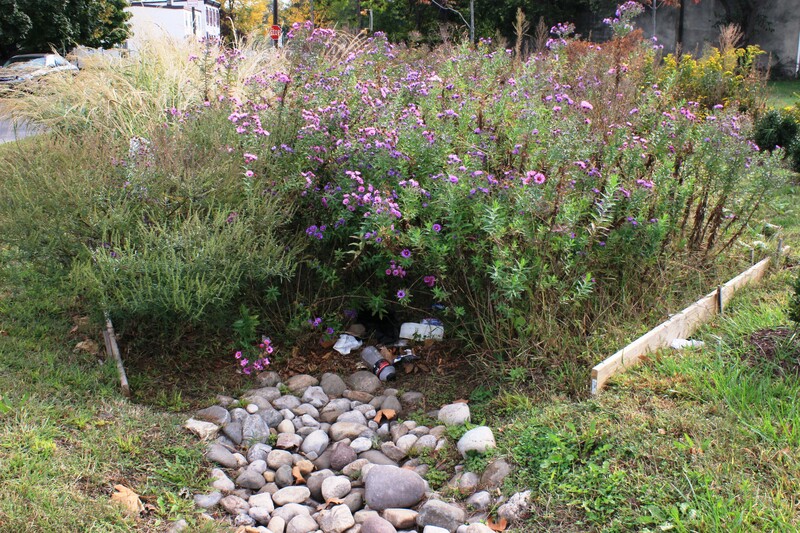 Rain gardens have been planted to help prevent flooding, though carelessly discarded plastic bottles and trash are caught in the wildflowers meant to absorb flooding rains. A vacant home being renovated by a non-profit group is on its second incarnation since evil factions broke into the home tearing out all of the improved wires and pipes. While we walked along South Broadway, you could imagine decades ago, how people would walk on the avenue to shop, stop at the bank, walk to church. Now, on a Saturday morning, there are few people on the streets; nearly every block or so, a prostitute stakes out his or her spot. 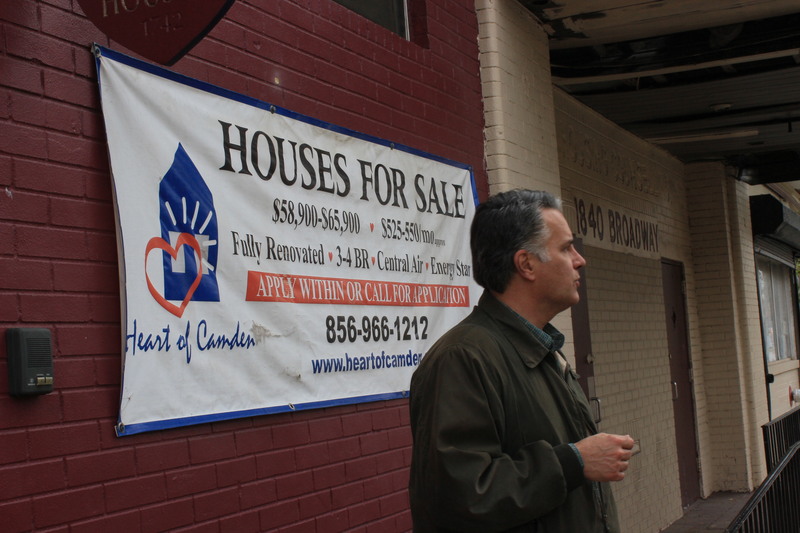 The Heart of Camden homes that have been renovated and purchased shine like diamonds, but there aren’t nearly enough of those homes to make up for the derelict buildings, not to mention the brownfields and Superfund sites preventing real progress. Yet, a community theatre, an arts center, a cafe and center for writers along with a new gym where children can safely play, exercise and grow are signs of hope and change. As Nancy said, it’s the children who can be the future of Waterfront South. They will learn to have pride and hope in their neighborhood and work for social justice thanks to the many people who understand and work in this village. Driving into Camden from the South Jersey suburbs brings home the thought that Sacred Heart Church’s Father Michael Doyle has pressed for many years: there are a thousands miles between the suburbs and Camden. When I heard Center for Transformation staffer Andrea Feirich and board president Mark Doorley talk about how Camden became cut off from the region when the Ben Franklin Bridge, Admiral Wilson Boulevard and 676 were constructed, it didn’t mean as much to me until today. My husband, son and I drove to help at the weekly dinner at Joe’s Place. The nondescript building across from Sacred Heart Church at Broadway and Jasper is in the heart of Waterfront South. Once we turned left onto Broadway leaving Rutgers-Camden, Cooper Hospital and Campbell’s Soup in our rearview mirror, it was if we’d stepped into a war zone. There’d be a few decent homes or businesses on Broadway or a side street, then vacant sites or more likely, boarded up homes, business and buildings that probably won’t see attention for years. We passed what looked like a group of volunteers serving a meal right outside in a vacant lot. Once we parked and got to the St. Vincent de Paul Society building, we knocked on the locked door. Once Burt let us in, we were welcomed by Sheryl and John along with the other volunteers who have given of their time, their hearts and souls to the community. This was our first time, so we were glad to do whatever was needed to serve dinner and dessert to about 60 people from the community. Precisely at 4 p.m. when the doors opened, the people appeared. Their faces showed a road map of hard life. Women and men came. Their clothes worn and torn. There were a few little girls with their young mother. One man had a very pleasant conversation with himself the entire time he was having dinner. But he looked me in the eyes and asked for his pie for dessert; then he went back to his seat to enjoy his dessert and continue his conversation. Except for one angry man, each person was so grateful for every bite they were offered. Many had two plates of food and two (or three desserts). It didn’t matter. Our hosts supplied the lovely meal. We were glad to serve and share a little of ourselves with others who have so little. When we were leaving today, dinner was still going on at Joe’s Place. I was getting in the car when a man walking through the vacant field next to the building yelled, “It’s not over is it?” I realized he was a regular at Joe’s Place and yelled back, “No, of course not; there’s plenty left.” The big smile on his face led me to think this might be his only good meal of the day and maybe for the week. He was carrying a plastic grocery bag. I know he was going to be taking some leftovers with him. We drove just 50 yards from our parking spot. Looking down the side street to my right was a drug deal happening before my eyes. The person in the driver’s seat gave the man standing outside the car the money; the two shook hands. The deal was sealed. There is so much work to do in Camden. So many lives that need tending to. But in reality, it must start with the youngest of the people in Camden. There’s a way out. The many good people doing wonderful things on a daily basis in Camden can make it happen for these children. The thing is, my hope is that the children see the light with the right guidance, then they will show others like them the way out. For now, we can all do just a little more – a day at a time. Inside Joe’s Place, everyone is good and safe and has a full belly. Let’s continue to pay it forward. More than 30 people gathered to learn about stepping up their service to the people of Camden. They came from Voorhees, Mount Laurel, Haddon Township and Ambler, PA. They all want to help bridge the divide of what Father Michael Doyle has said is the “1000 miles” between the suburbs and Camden. neighborhood remains in the shadow of the county sewage treatment plant, but how efforts are continuing to raise up the neighbors and citizens to improve their lives as well as their homes, gardens and parks. They heard about renovations of the building for the new theatre and nearby houses. The outcome of the gathering is expected to bring into the fold, more hands, hearts and minds supporting the many programs and projects stemming from Sacred Heart and the Center for Transformation and helping to close that “1000 miles” between the suburbs and Camden. You have to believe in networking. A long-planned meeting with the executive director of Sustainable Cherry Hill took place today at a local eatery. We got tons done in under 90 minutes. As we sat there at the table by the window, a woman who I’ve admired professionally for years walked by. She was coming in with her husband for some lunch. I approached the two of them and let her know I’d love to do work with her and her organization. She seemed enthusiastic about being in touch on that. Just when you think no one is listening, I get a LinkedIn message from someone who I hoped to do business with. Film at 11. I still have these ideas I need to formulate about connecting my business communications class and/or creating a new class.. to sustainable programs between Rutgers-Camden students and non-profits trying to make inroads in the city of Camden. More ideas forumlate each day. I’m starting to write them down. Meantime, our Phillies ballpark seat buddies are connecting with us for dinner in Philly in February. It’ll be totally strange to see them in something other than a Phillies shirt, not to mention seeing them in winter. OK, so this was a stream of conscience kind of writing day, but there’s lots to be done. Sleep is needed.